If for any reason you are not 100% satisfied with the performance of Hairfree you can return the full or empty tubes for a full refund. Use Hairfree for 60 days on your unwanted facial and body hair. This is sufficient time for you to experience the long-term hair reduction effects of the product. 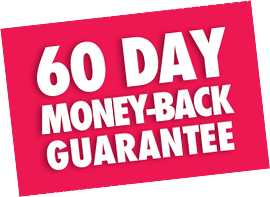 In the unlikely event of you not being 100% delighted with the results you can return the product for a full refund of exactly the same amount you paid. This will be credited to the credit card used when making the purchase or will be paid to your PayPal account. We accept the return of full, used, partly used, or empty tubes. Cost of returning products is the responsibility of the customer. We refund the original shipping cost (if any) together with the full cost of your order. Incredible – but true – free worldwide shipping when you buy 2+ tubes or a Value Pack! We’ll ship your order free of charge to ANY country by First Class Registered Mail. 7-10 days depending on country. Orders are shipped by First Class Registered Mail. We ship Monday through Friday, excluding weekends and holidays. We do NOT ship orders the same day because we need 24 hours to verify the shipping address and payment method. All Orders Shipped in Discreet Plain Packaging. Your privacy and peace of mind are important to us. For your privacy, all orders are delivered in discreet outer packaging with no company information or product description displayed on the box or on the customs form. Wednesday). You will receive a tracking number once we have shipped your package. Tracking Your Order Once your payment has cleared, you will receive an e-mail when your order has been processed. You will receive a confirmation e-mail once your order has shipped, which will include your tracking number and a link to follow the progress of your package. Some postal authorities do not update their tracking information regularly so please be patient if details of your shipment are not immediately available. When no tracking information is shown, this indicates your package is in transit to you and the postal authority have not yet updated their records. This does not mean your package has not been sent or is lost! You can also track your package by visiting the Track & Trace page of you local mail provider and inputting the Tracking Number. Please allow a few days for the tracking information to show. In some rare case, the tracking information may not update but you will still receive your order. Please contact us after the estimated delivery time has elapsed if you have not received your order. Orders are shipping by First Class Registered Mail. We ship Monday through Friday, excluding weekends and holidays. We do NOT ship orders the same day because we need 24 hours to verify the shipping address and payment method.